of the network and it is also more efficient than other existing algorithms. tion of the networks against attacks is the central issue. has to take these difficulties into account. single-stage attacks cannot be used. makes extremely difficult to compute the equilibria. patterns obtained by data fusion and adaptive control. Autonomic Computing at University of Arizona. sible actions and counteractions, damages and costs, etc. give relative importance factors for all pairs of categories. 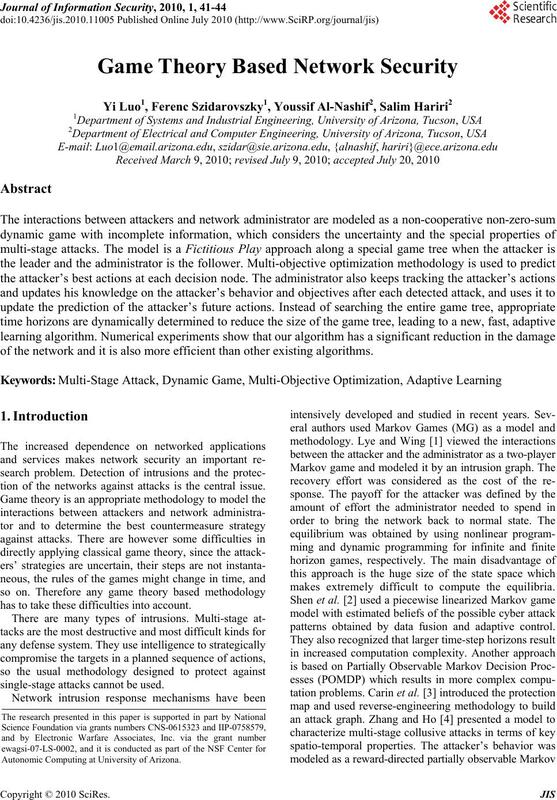 attack and will be used in the game tree analysis. 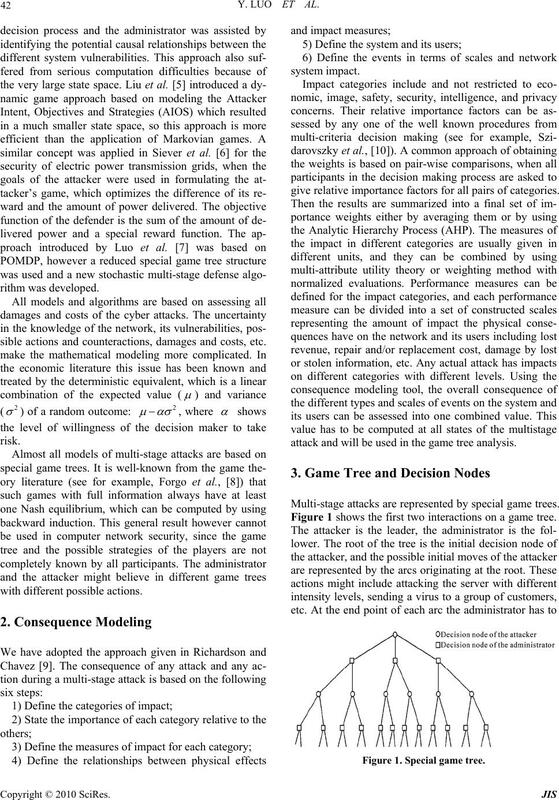 Multi-stage attacks are represented by special game trees. 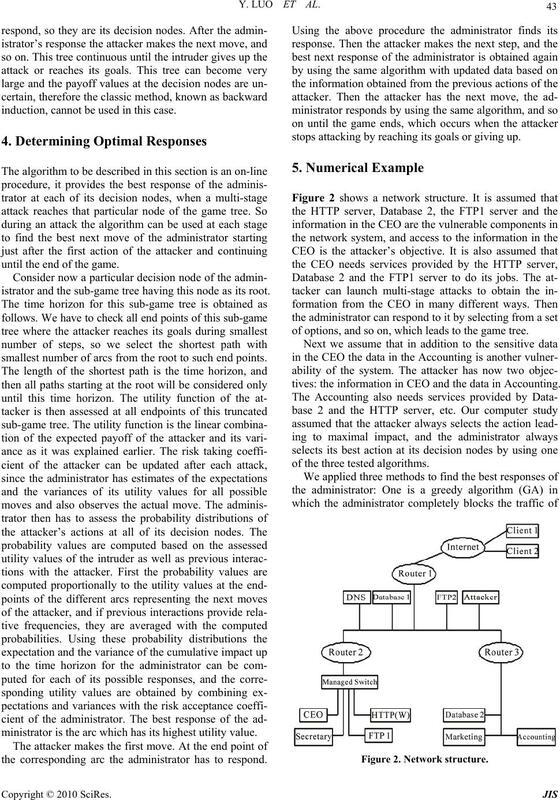 Figure 1 shows the first two interactions on a game tree. Figure 1. Special game tree. induction, cannot be used in this case. until the end of the game. istrator and the sub-game tree having this node as its root. smallest number of arcs from the root to such end points. ministrator is the arc which has its highest utility value. the corresponding arc the administrator has to respond. stops attacking by reaching its goals or giving up. of options, and so on, which leads to the game tree. tives: the information in CEO and the data in Accounting. of the three tested algorithms. Table 1. The performances of the three algorithms. is the one we developed. The results are shown Table 1.
would not alter the main steps of the algorithms. response of the administrator at any stage of the game. 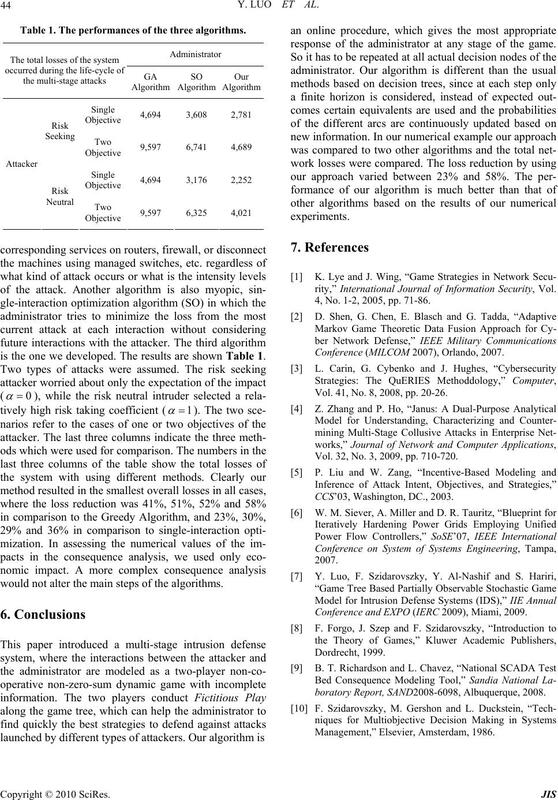 rity,” International Journal of Information Security, Vol. 4, No. 1-2, 2005, pp. 71-86. Conference (MILCOM 2007), Orlando, 2007. Vol. 41, No. 8, 2008, pp. 20-26. Vol. 32, No. 3, 2009, pp. 710-720. Conference and EXPO (IERC 2009), Miami, 2009.
boratory Report, SAND2008-6098, Albuquerque, 2008.